Be mindful of the way you move around your bird. Smooth, slow movements are less likely to frighten birds. Likewise, speaking in soft and soothing tones will also aid in helping to keep your parrot calm and comfortable with you and your voice. The Alexandrine parakeet is a brightly colored, medium-sized parrot. These birds are highly intelligent and can make wonderful pets when properly trained and socialized. 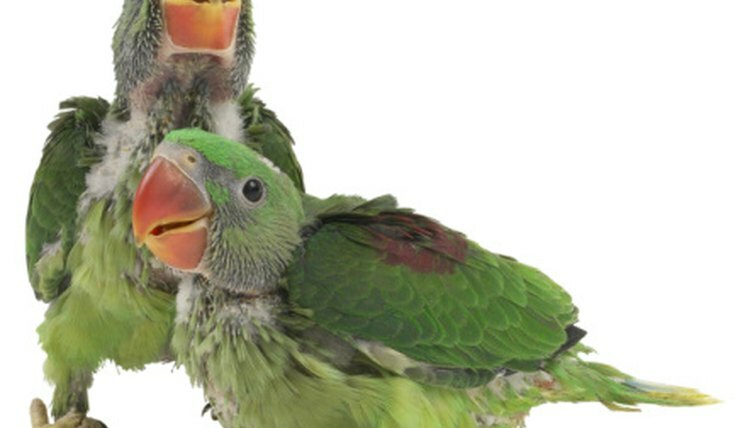 Because birds are often prey animals in the wild, however, these parrots will be shy without socialization and may even bite due to fear. House your parrot in a calm, quiet location. Alexandrine parakeets can become startled when they hear loud noise and may bite if they are overstimulated. Keeping your parrot in a quiet place will help your parrot to feel safe and secure and make it easier to tame. Approach your parrot from the front. If your parrot is frequently surprised by you, it's more inclined to bite. Moreover, if the parrot learns to associate you with being startled and feeling fearful, it can be more difficult to bond with your parrot. Feed your parrot by hand. When birds learn to associate people with positive things like food, they're less likely to be startled. While it's important that your bird always have access to food, if you can hand-feed your bird several times a day, your bird will become more easily socialized. Open your bird's cage and allow it to walk around. Be sure to only do this in an enclosed, safe area. Don't approach your bird or attempt to catch it. Instead, simply get your bird accustomed to walking around near you. After your bird has gotten comfortable with this task, calmly hold out a treat for your bird. Wait for your bird to approach you and give it the treat. Practice this several times a day for a few weeks. Encourage your bird to perch on your finger or on a perch. Place a perch outside your bird's cage and open the door. When your bird hops on, give it a treat. Then place your fingers next to the perch and encourage your bird to perch on your fingers. Give it a treat when it does this as well. Practice this exercise several times a week.